7. 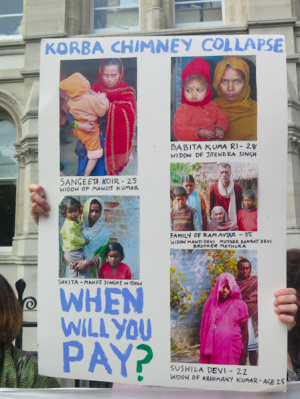 With regard to the social licence to operate, the company claimed again to respect free, prior, informed consent (FPIC) for indigenous peoples which relates both to Vedanta itself and their domestic suppliers. The company are spending over $17million on Corporate Social Responsibility (CSR) projects, improving, he claimed, 260,000 lives. He boldly claimed that the company’s commitment to sustainable development is something shareholders can be proud of, and has been recognised by others. 8. To conclude, he said, the company will continue to increase production, will keep a tight control on costs, de-lever the balance sheet, simplify the group structure, will protect and preserve its social license to operate and the environment. Mr Albanese noted how much he will miss the company and working with its chairman. 9. We then moved onto questions. 11. Mr. Agarwal noted, in response to his generosity, that in terms of returning money the company is keen to ensure the money will go back to society. The company plans to adopt 50 million children and 20 million women, noting “we need to ‘lift them'”. There is a need to create a world class India. “India is the largest democracy in the world and we need to educate our children.” Hopefully “we will put in a billion dollars to create a university, a think tank.” He noted that the liberal arts create great potential and will be a strong focus. The question on cobalt was passed over to Steven Din, who noted that KCM already extract cobalt at 2-5 tonnes a year and have larger total resources. They are exploring the opportunities to expand and are aware of potential markets. 13. Mr. Albanese replied that he wanted to reinforce that the policy covers not just Vedanta, and includes what is happening in Orissa. “We will respect the wishes of people,” he said. The situation in India is that FPIC is in the law, and the gram sabha system codifies it. 19. Anil Agarwal said that the Government of Punjab took the land. He said it was not Vedantas’ responsibility to buy the land. He then passed over to Samir Cairae. Mr Cairae noted that he knows the plant well as he goes there every month. He claimed it is one of the most advanced plants, and that it complies not just with the Indian Government’s standards, but that it is one of best in the world. On the situation of fly ash, the technology is world class, it is not being dispersed. He noted they are proud of the plant as the fly ash is being used for building material in the region. He issued an invitation to join him on one of his visits. 21. Mining researcher Roger Moody prefaced his question by saying hello in particular to Mr Albanese, noting that in his time he had brought a certain weight to the company and done his best to balance some of the bombast from others. Mr Moody noted although Mr Albanese was leaving, he was still up for election as a director, so not really leaving the company. (Mr Albanese said he would respond to this, but unfortunately it was lost in other responses). Mr Moody’s question was in response to points made by the Norwegian Pension Fund Council of Ethics (NPF CoE), noting that, having been in touch with them since 2012 regarding the 2007 exclusion of Vedanta by the Fund,the NPF had recently produced a new report and confirmed the company’s exclusion. The new report noted that with regard to the company’s explanations on the reported poor conditions at the Bodai-Daldali mine, Mr Albanese had promised that he would visit the mine. Was this promise fulfilled? 24. A further exchange continued over Mr Moody being thwarted in going to the site to inspect ite unannounced, and Mr. Albanese noting that there had been an invitation, but that Mr Moody had already left the mining area. Mr Moody then asked about how long Albanese had visited, and Mr. Albanese noted it was two days in June and that he had spoken to local people. Mr Moody noted he wanted to stress that he wasn’t saying he wanted an end to manual labour, and there should be consent among the workers/community to any change. Mr. Albanese said he thought the company did its best in difficult circumstances. 25. Mr Moody raised another issue that was in the CoE report, which was with regard to the BALCO (Korba) disaster and the situation of the workers involved. Mr. Albanese noted that there are ongoing court proceedings, but the company had done studies. Samir Cairae took over on this, noting they have been improving the situation with regard to families. There should be an investigation and liabilities should be fixed, but the company’s priority should be to the families. They asked researchers to do a study looking at 40 families. The company will share the report, but note that the initial results show that the majority of income levels have increased. Roger saidd that we would like to see the report being referred to. He added that it wass after the event, and is about compensation, but the point is – asking them to agree – that the accident should not have happened. There has still not been an independent report on what caused the accident. The Bakshi report is still under wraps, thanks to the company, and is sub judice. 28. At this point something of a general free-for-all argument broke out when a shareholder (Mr Pradeep Sharma) objected to the line of questioning. He argued that this was an operational concern, and the AGM was for strategic discussion: “This should be strategic. It is accident – accidents are terrible, but this is operational & more for the Government of India”. 31. Mr. Albanese replied that the company do take human rights very seriously, and lived up to what was in their reports. He suggested that the paraphrasing used may not have captured the detailed legal arguments. However, he noted that there was a court case under way and so he cannot be too specific on the issuesin the case. He said that these were mainly legacy issues, and that they had been going on for 70 years or more. He passed over to KCM CEO Steve Din, who explained what the company was doing with regard to sorting issues around the dam and on activities in downstream water management. They are “doing what they can and are improving the company’s ecological footprint, working with the Zambian Government. They are listening more closely to the concerns of local communities, and have a number of projects including the improvements to the smelter so that it is a world class smelter”. 44. Mr. Albanese replied that they take this seriously. He noted as an American he still believes in the Paris Accords. He claimed India takes this issue seriously. Access to power is important to the country becoming more affluent. This has to be done quite quickly. The company have had discussions with the Government of India on carbon capture and storage, to help the Government of India in ths regard. “We are seriously increasing our commitment to renewables. The world will look different soon with how it sources its electricity”. 45. Samarendra Das started by referring to the earlier concern about what was said to Simon Chambers. There was a request to look at another incident that was raised in 2015, regarding a victim called Rajkishore Yadav who had acid poured over his body by accident and never got anything.Yadazis living in a small town near Gaya in Bihar and lost his sight and apparently cannot walk. Mr. Albanese asked for more details, and gave a commitment to look into it. 46. Samarendra then followed with regard to KCM and the legal status of the company: “Under Zambian law, public companies (PLCs) are obliged to file annual accounts with the Patents and Companies Registration Agency (PACRA). Members of the public are entitled to request copies of these accounts from PACRA”. Steven Din said you can obtain the details by applying for a small fee. Samarendra responded that using channels available to ordinary Zambian citizens, one can obtain the accounts with a fee for this service of approximately £3.50 for each company. “Since 2012, it appeared that accounts for some of these companies, including Vedanta, had not been filed with PACRA. This experience of OECD, DfID appears to substantiate the allegations referred to by the Committee that the system is not working properly at present. For private companies, there is no requirement to file accounts with PACRA. The main mining companies operating in Zambia are private companies. Under the Securities Act, Cap 354 of the Laws of Zambia, all financial intermediaries conducting securities business in Zambia must be licensed by the Securities and Exchange Commission; the licensing process includes submission of financial statements; and these financial statements are available to members of the public. Whilst this mainly applies to financial institutions, some private companies are also registered as issuers of debt and equity instruments. However submission of accounts is only required at the time of licensing or renewal, not annually. The availability of accounts from the Securities and Exchange Commission was not tested. 51. On the filing, he noted the company do filings, and have voluntarily published these in the news paper. One doesn’t need to pay 3.5 dollars, as one can read them in the newspapers. The company has had a number of forensic investigations and found nothing of concern. They have an audit committee and audit report. There is a clear delineation, and would stand by that. Samarendra then followed up asking what is the status of KCM in Zambia? The reply was that it is a private company. 55. Mr Sharma then made an observation that he felt the AGM was being hijacked by some activists over a number of years. He believed that if they didn’t get a reply they want, they should go to the Government of India. They claimed they don’t write to the company, but just bring issues here. 57. Simon Chambers then intervened, saying that the company did build an illegal refinery. He reiterated that the company’s critics do write letters (after all. his question was a follow up to a letter! ), but the problem is they don’t get answers. At this point Simon walked out, angry at not getting adequate answers. 61. Mr. Albanese said that he takes on board the request to get out better news. With regard to the Norwegian Pensrion Fund, he noted it is the deepest of ironies that the money for it comes from oil. He stated that there are a number of companies that are excluded. It does not affect the company pension provision; it is a separate investment fund. He affirmed that the company do take it seriously, particularly as it affects other investors. The Council on Ethics is not going to be in a rush to change their opinion. The company needs steady, regular engagement. He noted the key target of investment people would be to get their investment back.